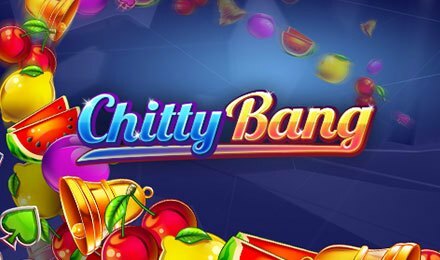 Chitty Bang is a 5 reel and 972 ways to win fruit slot machine! You must’ve been expecting something totally different, but Pariplay totally played you! The game is built on a wonderful Las Vegas theme, with the classiness and smoothness of the game that accompanies it. Find symbols like; Lucky 7, Stars, Bells, Watermelons, Cherries, Lemons, Plums, Clubs, Heart:/.s, Spades and Diamonds on the reels of Chitty Bang Slot. Before you grab a drink and sit down to spin this game, set your stakes on the Bet Field, using the + or – buttons. After doing that, click on the spin button the get the game started. Autoplay is at hand, and allows you to enjoy a wide selection of auto spins. Select 5, 10, 15, 25 or 50 automated spins to put to play and enjoy watching the game play hands free! Coin Values: Stakes range from £0.50, £1.00, £2.50, £5.00, £12.50 and £25.00. The most rewarding symbol is the Diamond wild symbol, which replaces all other symbols bar the scatter symbol. For a combination of 3, 4 or 5 symbols, 2x, 3x or 8x your stake is awarded. The scatter of the game is the Bang symbol, which triggers the bonus round of the game. Landing three, four or five scatter symbols anywhere on the reels will trigger the Free Spins Feature. For three, four or five symbols, you receive 8, 12 or 40 free spins. During the play of the free spins feature, symbols on reels 4 and 5 merge to act as 2x2 symbols. On reels 1, 2 or 3, some symbols are lit up. If all 9 positions are lit, a respin is awarded. Reels 1, 2 and 3 on that respin feature colossal 3x3 symbols. This guarantees winners a massive opportunity to grab a massive win. Now that you know what is waiting for you on Chitty Bang slot, why not launch the game at Moon Games Casino, on your mobile, desktop or tablet! Spin away and enjoy a smooth gameplay on Chitty Bang slot!